From Cherry Trees to Wooden Teeth– Happy Birthday Mr President! It’s cherry season again. Not when the trees blossom or or the fruit ripens but the month that has become synonymous with cherries. As a food writer for most of my life, it’s a given that any column you do in February should involve themes of chocolate or cherries or both. 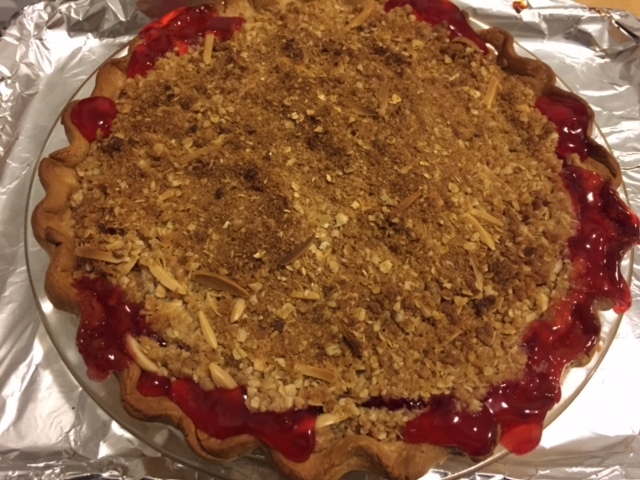 We are now past Valentines Day and sandwiched between Presidents Day and Washington’s official birthday which means it’s time for cherry pie. Before we start the recipe, let’s first review the cherry tree legend. 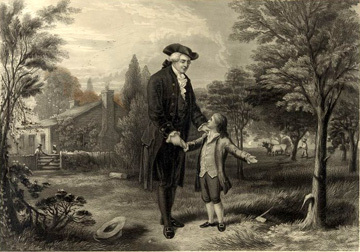 From our earliest days in elementary school, we were taught that young George Washington was given a small hatchet at age six to play with and went to town whacking away at bean posts in his parent’s garden. Something possessed him to take a swing at his father’s cherished cherry tree. When George’s father first discovered his favorite tree had been axed he was angry. George supposedly came forward and fessed up because he “could not tell a lie”. This impressed his father who valued his son’s honesty over a thousand trees . The iconic tale has been one of the first lessons on values in American classrooms. There’s just one problem with it (aside from the bad choice of toys for one’s child): most historians agree that it never happened. The story was first published by biographer Parson Weems in 1809. The tale came from Weem’s interviewing a neighbor who had known Washington as a boy. This is the only historical source and not considered to be very credible which brings us to the next famous folklore. 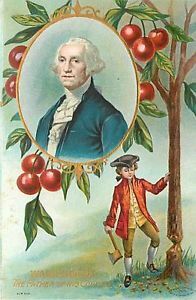 Washington most likely did not eat his cherry pie with wooden teeth. He had notoriously bad teeth, in fact he had only one tooth left by the time he became president. Instead, he wore dentures fashioned from cows teeth, hippopotamus ivory even human teeth his dentist had purchased from slaves. None of these worked out that well because Washington was said to have been plagued his whole life with chronic pain from his false teeth. 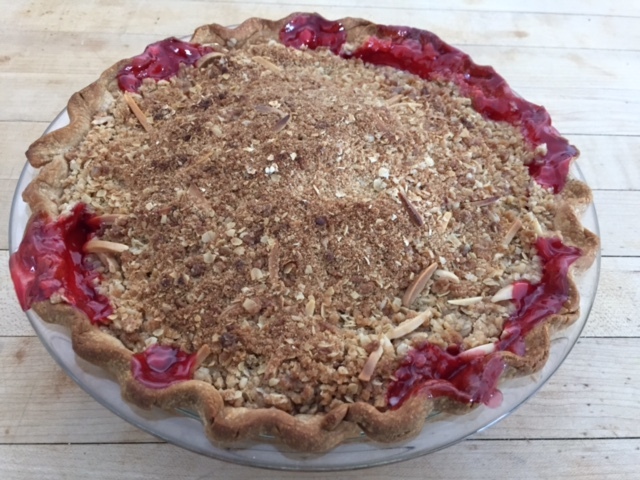 This year my spin on the cherry tree/ cherry pie theme has a classic crumb topping with some toasted almonds in it. It’s a great version for those of us with a sweet tooth who like the contrast to tart cherries. 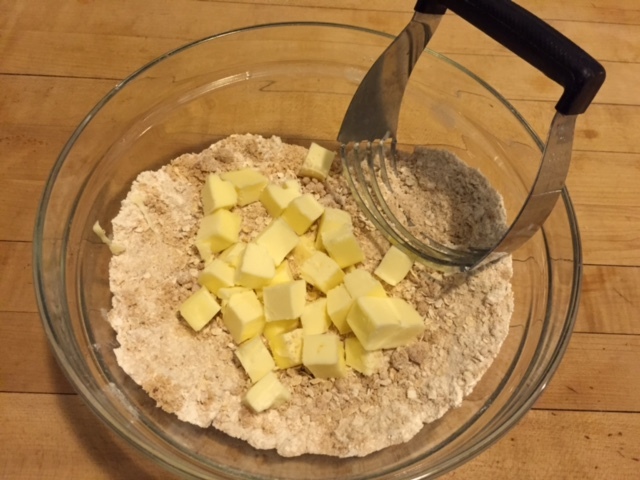 Combine brown sugar, oatmeal, flour and salt in a mixing bowl. Using a pastry blender or two knives, cut butter into dry ingredients until crumbs are about the size of small peas. 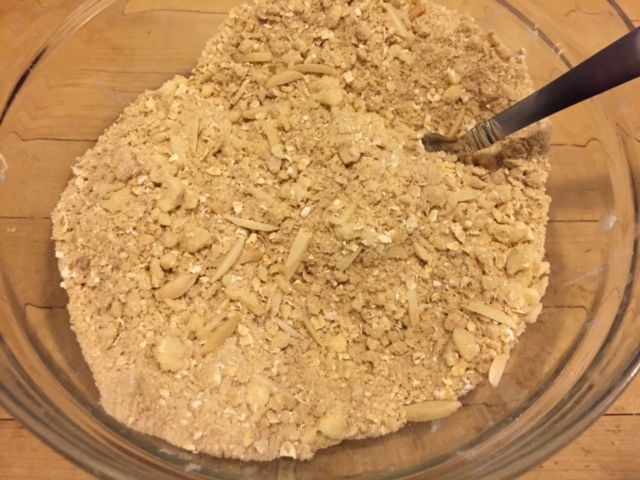 Stir in almonds. 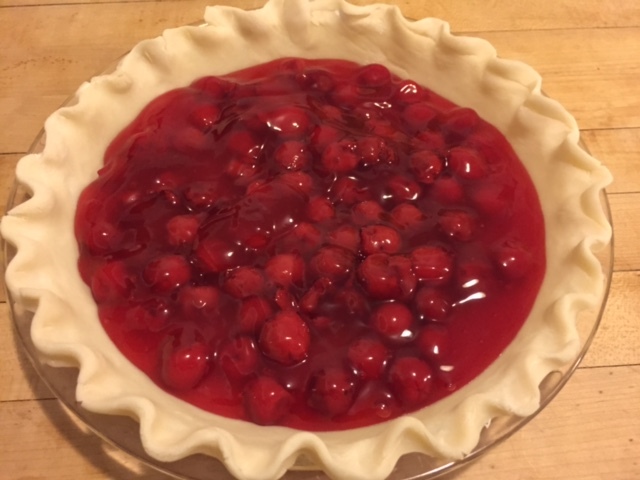 Spread cherry pie filling into unbaked pie shell. 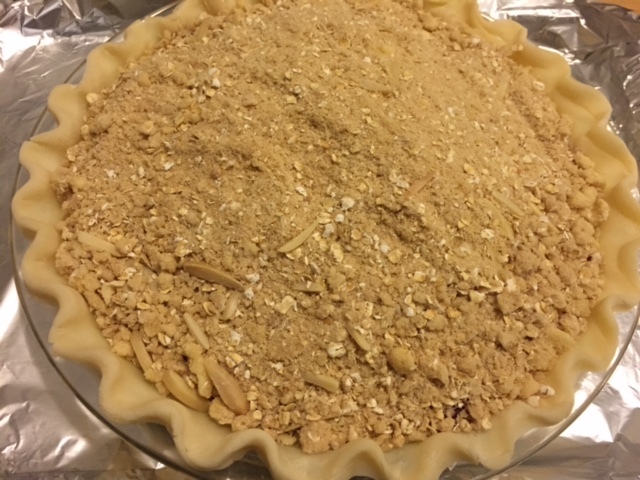 Cover filling with crumb topping and place on a foil lined baking sheet. Preheat oven to 375° and bake on the bottom rack of oven for 50 minutes or until crust looks golden. I like to use glass pans for this reason. If the topping starts to brown much faster, lay a piece of foil across the top of the pie during the last 10 minutes of baking. Cool to room temp before slicing. Place cherries in medium saucepan and place over heat. Cover. After the release most of their juice, which may take several minutes, remove from heat. In a small bowl, mix the sugar and cornstarch together. Pour this mixture into the hot cherries and mix well. Add the almond extract, if desired, and mix. Return the mixture to the stove and cook over low heat until thickened, stirring frequently. Remove from the heat and let cool.